No, those two things in the subject have nothing to do with one another really. It’s an accident of proximity. After spending the entire week in the knitting black hole where hours of knitting produce… nothing… the Rooster Feather socks are up to the gussets. At last. They might still be in the black hole, except I decided rather nonchalantly that I would check my row gauge. Yes, gentle reader, when knitting socks there is a difference between 12 rows/inch (assumed gauge) and 11 rows/inch (actual gauge). By a stroke of good fortune, the knitting gods smiled on me and I checked gauge just when I got to the place that it mattered. What are the odds that will ever happen again? What can I say except do as I say and not as I do! 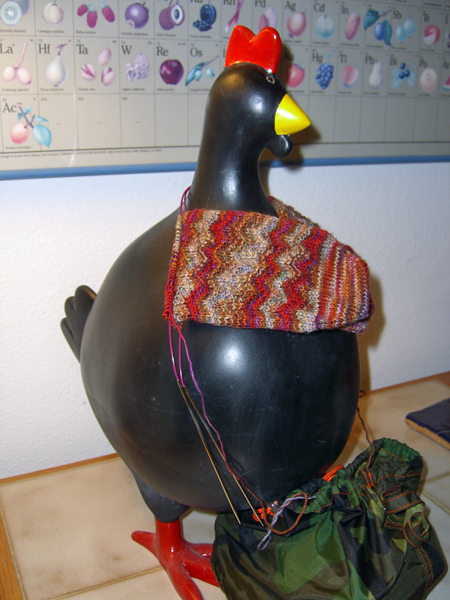 Here we see the Rooster Feather socks being used as a neck warmer by my blackboard chicken. She seems a little surprised, don’t you think? The color pooling is still playing happily with the condensed feather and fan pattern. It was a good choice for these socks. I wish I didn’t need to take flash pictures, but it’s so dark at my house in the winter. At this time of year, the sun makes it over the mountain for only a brief time before setting. Although we’ve been having temperatures in the 40’s during the day, there is still ice in the gutter in front of my house. It’s cold in the shade, and there just isn’t enough sun to warm things up all the way. The good news is that no more water is being added into the mess so whatever leak there was up the street must have been fixed. The ice is slowly evaporating. If we could get above-freezing temperatures at night, I think the ice would finally melt. Yes, that is the Periodic Table Of The Fruit And Nuts hanging behind the chicken. When not using the blackboard chicken to leave a message for #1 Son, I used to write Welcome! on the chicken’s side. A nice little greeting for visitors, you know. My message would be crossed out and added to by #1 Son and his teenage cronies. For a long time it said pay homage to my chicken gringo. I never exactly understood that, but I’m willing to go with the flow. We live on the nutty side of the above mentioned periodic table. Some people have had trouble commenting. 😥 Last night I fired my old spam-blocker and hired a new one as I think that was contributing to the issues. Please leave a comment to help me do a shake-down test. Thanks!